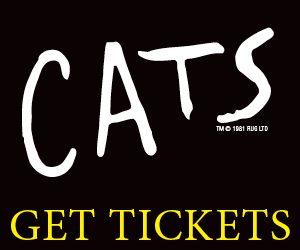 “So many millions of people have a love affair with this show; I feel it is important to give them what they remember,” says Andy Blankenbuehler, who is choreographing the first Broadway revival of Andrew Lloyd Webber’s Cats, the musical phenomenon that has captivated audiences since the 1980s. Blankehnbuehler himself was just 12, a Cincinnati preteen himself bitten by the theater bug, when Cats first opened on Broadway. As an aspiring dancer in 1990 at age 20, he says, he was inspired by the extraordinary success of the dance-focused mega-musical when he moved to New York City to pursue his dream. “I literally had a photo of the Winter Garden [theatre] Cats billboard over my bed,” he recalls. “More than anything else, the impact the show made on me was that a historic thing could happen because of dancers — that dance could touch the lives of so many people every night and make a difference. It made the sacrifices of making no money and living in a five-flight walk-up in New York worth it. The irony was that I never got to dance in Cats ,” he adds. In the mid-1990s, the young dancer went on tour with Lloyd Webber’s Music of the Night, but he got to know the composer personally only after he took on the job of directing and choreographing the recent national tour of Lloyd Webber and Tim Rice’s Joseph and the Amazing Technicolor Dreamcoat. By this time, of course, Blankenbuehler had received a Tony Award for In the Heights and two subsequent Tony nominations for 9 to 5 and Bring It On. “Andrew reached out to me and asked me to fashion and write a new concert retrospective of his work, and that’s really how we got to know each other,” he explains. And then, not long after Hamilton began its charmed life at the Public Theater at the beginning of 2015, Lloyd Webber asked Blankenbuehler if he would like to choreograph the Broadway revival of CATS. A new, slightly tweaked production had just opened in London the previous fall, but the creators were looking for a fresh take for Broadway.